Nut too tight on string? I go through a lot of D strings. Sometimes they break when the guitar is just sitting there. The breaks are always at the nut. I suspect the nut is rough or tight on this string, and so it doesn't slide easily through. I tried lightly sanding with some 400 sandpaper, but no change. If you had this problem, what would you do? Hi James, welcome to the forum. I'd look at at the edge of the nut to be sure it's not sharp there. What guitar is it? Just to dismiss the obvious... is this standard tuning, (A above mid C @ 440)? Thanks for replying. Yes, standard tuning. I use a cheap electronic tuner and just do what it tells me, though sometimes I do tune with harmonics, after I've established the low E. I just strum along now and then; no tricky stuff for me. What brand/model of guitar and what brand string do you use? A little graphite in the nut slot might help a bit....just rub the point of a pencil in the slot until it's darkened and give that a try. Also, just curious, as you take the D string to the string post, do you wind the excess toward the outside of the head or toward the center rib? If the slot is not angled toward the outside and you wind it toward the outside, at times that can create a bind and it makes it easier to snap a string. You should be winding the excess string toward the center of the head, regardless.....the E and the A wind toward the outside, the D and the G toward the center rib, the B and the e toward the outside of the head....try that if you haven't. my guitar is nothing special -- c40s. I'll try the graphite: thanks! On winding, the D is wound inward, so it's almost straight from nut to post. Oddly, low E is wound inward and has a steep angle, which I'll fix, but that string is never a problem. Maybe that thick string is more robust. I'll remember that winding detail in the future. So it seems that a nut defect -- tightness, burr, etc. -- is not a likely problem. I'll try the fixes suggested and report. Thanks, guys! How did the graphite trick work out for you, James? I haven't even relocated the strings on the post yet, been only too happy to play it as is and will correct it when I put on some new strings. I do notice that on the D string, as I tension the strings, you can clearly hear the string's windings clicking as they are pulled into the nut slot, indicating to me that if the nut is not bone there will soon be some wear on the nut slot at least, perhaps a broken D string. I'll also check the nut and saddle to see if they need to be replaced with bone when I replace the strings....I've looked with a magnifying glass and can't see any end grain on the nut, so I'm suspecting it's not bone. That's another suggestion I would have for you....replacing the nut with bone is often thought to yield an improvement in tone, and I do notice an improvement in sustain when playing open strings/first position chords, but the greatest benefit is freedom from wear in the nut slots over time. Bone won't wear, plastic most assuredly will. I always replace the nut/saddle as a pair, just my compulsive nature, I guess! The graphite trick work wonders. Lots of good lutherie in the making of the C124SWK I bought, sure wish there were more of them around. 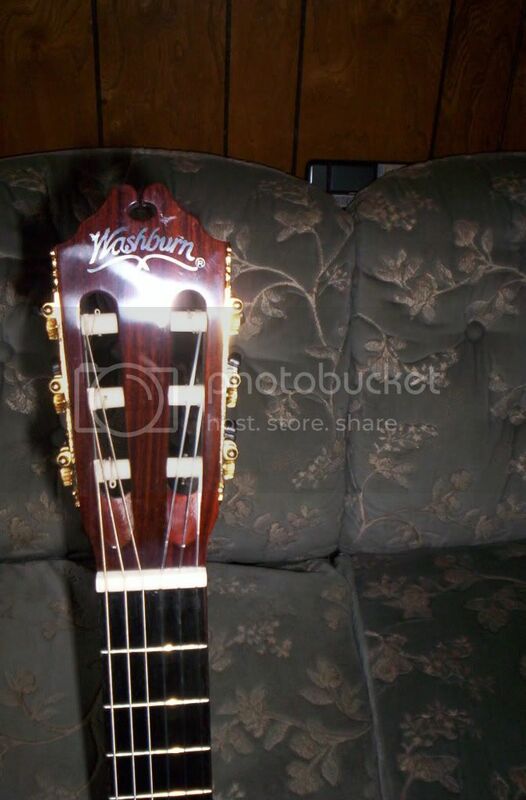 I looked at the headstock of a local guitar department head's guitar and the guitars in his shop years ago. He winds the E's outward and all others toward the center of the headstock to keep the string travelling in as straight a line as possible. Same for a luthier who builds concert caliber guitars. I think this is pretty well established practice to reduce string pinching in the nut slots. The D string has the most delicate wire wrap. So the nut slots should be smoothed and angled at the rear side by a luthier or setup guy with nut slot files. The width and bottom shape and angle of string travel make a difference and leave it to a guy who does it for a living. It only takes 10 minutes to check and correct it. Graphite is OK to use in the slots, but a properly cut nut is the place to start.